Most schools these days routinely monitor students’ exercise books in an attempt to extrapolate the quality of teaching. In some ways this is positive and reflects the growing recognition that we can tell much less than we might believe about teaching quality by observing lessons. On the whole I’m in favour of looking at students’ work, but, predictably, book monitoring goes wrong for pretty much the same reasons lesson observation doesn’t work. The thing is, there’s nothing wrong with observing lessons, work scrutiny or any of the other practices used to peer inside the black box of teaching quality, the problems stem from how the information gleaned is then used. If I observe a lesson with a checklist of criteria like the one below, I will be viewing the lesson through a set of predefined parameters which will inevitably distort what I see. It’s not that I think Ross McGill’s approach is unhelpful per se – in fact, as he explains in his post, the idea that this monitoring should be accompanied by conversation with students is probably useful – but by using the pro forma he suggests then the best you can expect is to find what you’re looking for. What, you might wonder, is wrong with finding what you’re looking for? 1. Teachers must have a secure overview of the starting points, progress and context of all students. 2. Marking must be primarily formative including use of a yellow box which is clear about what students must act upon and selective marking, where relevant. 3. Marking and feedback must be regular. 4. The marking code must be used. It comes down to whether you’re more interested in getting what you want or trusting people to do what is best. Instead of looking for items on a checklist we should be looking at what is there and asking questions about why it’s there and what it represents. As I’ve argued before, accountability only works if those being held to account are prompted to try to be their best instead of trying to look good. When teachers are told what good looks like, they know that anything that deviates from this expectation is likely to be viewed with suspicion and subject to misunderstanding. The safe option is to cover your back, give the observer what they want and regularly festoon your books with yellow boxes. Now, let’s consider the evidence. Teacher 1’s students have produced work which is untidy and lacking in quality. Teacher 2’s classes, on the other hand, have produced some great stuff, but it hasn’t been marked. Teacher 3’s classes are turning out rubbish work which is also going unmarked and the students of Teacher 4 are working well and their work is being marked. What does this tell you? Which outcome do you prefer? What assumptions are you in danger of making? What questions would you want to ask? The last two cases present few difficulties. It seems reasonable to have a word with Teacher 3 and suggest her books need marking. Even if we charitably assume that there are other methods the teacher might be giving feedback, clearly it’s not working. In the case of Teacher 4, both teacher and student seem to be doing exactly what’s expected and required. Case closed. But what about the first two teachers? What has our scrutiny actually revealed? I’d want to have a chat with Teacher 2 to find out how this magic is being worked. It would be interesting to compare students’ work across subjects to see whether they’re all simply highly motivated young chaps who do what’s required despite feckless teachers. I might want to speak to some of the students to ask about the conditions under which their work was produced and to find out whether they have been receiving feedback through means other than marking. But, if the work is good, the last thing I want to do is tell off the teacher. Teacher 1 though is a cause for concern. Despite the work being marked it’s just not up to snuff. Is this because their students blithely ignore their teacher’s earnest efforts? Might it be that the presence of marking isn’t providing useful feedback? If the teacher is working hard to mark, but the quality of work isn’t improving, maybe the teacher needs some support? Or perhaps the situation will right itself given time and should just be earmarked for further monitoring. It should always be remembered that treating teachers equally is fundamentally unfair. Both of these cases reveal circumstances where book monitoring could go wrong.It’s far harder to assess the quality of work than it is the quality of marking and so we have an entirely natural tendency to do what’s easier. If we’re just looking to see whether a marking policy has been followed Teacher 1 might get a gold star, despite the poor quality of work. And I can well imagine a scenario where Teacher 2 is forced to comply with a marking policy despite the successes of the students. Who cares if marking is regular or in line with a policy as long as the work students produce is of a fantastic quality? And if the work is ropey, only a fool would be happy if the marking meets expectations. This should be the standard against which we hold teachers to account: Is the work great? If the answer’s no, then whatever they’re doing isn’t working. But if the answer’s yes, no other question need be asked. More likely that teacher 1 is spending so much time marking that they have little time to plan. Marking (or, at least, checking) is part of good planning though. How can you plan without knowing what your students are thinking and writing? Do you think you have to make marks in books to know what students are thinking or writing? It seems to be a fairly common view. And it’s wrong. I am heartily sick of the pseudoscientific crap that hard working teachers are being subjected to. And now there seems to be a whole army of edu-types ( the large majority of which don’t seem to teach much) on twitter leading discussions solely through having the loudest voices. Could there be other factors in the quality of work from teacher 1’s books? Good/bad/indifferent teaching is not the only thing that impacts on the quality of work. In addition, is there a common understanding of ‘quality’? Again – what looks good, may not be what is good. A related point is that it is really only heads of department who can judge the quality of work. So why bother involving all of these other bored, overpaid managers in the process? That’s not quite true – any subject specialist ought to be able to have an informed view on the quality of work in books but you’re right that preventing SLT PE teachers from quality assuring maths books is probably in everyone’s best interest. Yes, any subject specialist could do it. But a head of department still has hands on day to day experience too. In any case, most SLT are not qualified to make judgements of most books. Anyone outside teaching would think that TTs form was perfectly reasonable. The problem comes when managers want to find fault. They use this type of paperwork as evidence in order to bully certain staff. Also I am not in favour of whole school policies (they only exist because otherwise OFSTED) will criticise the school for being inconsistent. Here’s another problem… Managers are judged on their ability to force everyone to comply with a whole school policy. It doesn’t matter what the policy is as long as everyone does it. Then that manager can wax lyrical at interviews about what what they’ve done for* the school and then get promoted. Enough of the Argumentum ad Seniorteamium, from Radice and Co. Focus on the topic. When one carries out a book look/work scrutiny/call it what you will, is one looking at the quality of the a student’s work, the quality of the teacher’s comments or the response of the student’s comments to the teacher’s comments? The list could go on. Whichever area you are looking at requires a different set of criteria and a different set of outcomes. The difference between a simple check that the marking policy is being followed compared to what the quality of work is showing is vast and complex. Perhaps a significant refinement is needed in this area of scrutiny and coaching teachers in to being able to provide feedback which truly enhances learning is something that needs as much effort as classroom teaching practice practise. Nevertheless, to David’s table; I would want to know of teacher 2 if he/her were to mark and if it were carried out in the right way* whether this would result in even better quality work coming from his/her students? Should teacher 2 be marking? *What is the right way to mark a piece of work? I agree and perhaps I ought to be trying to find out what it is teacher 2s do in their whole practice which produces such good work. I’ve posed it as a question on interview to aspiring middle and senior leaders, “You have a member of your team whose students produce great work and get great results, but he/she refuses to follow department procedures, specifically marking. What would you do?” I don’t think there’s an easy or simple answer to this and it’s as much of a challenge for those asking it as the candidate faced with it. The danger is amplified by my mother’s story from when she trained as a nurse back in the 60s; she was regularly instructed to wake the patients up in order to give them their sleeping pill. If I am part of the co you mention, then thankyou. I am focussing on the topic. Recently a manager failed to notice any of my marking during a lesson observation. I and my dept are being told how to mark by someone who feels they are above scrutiny. They are not able to demonstrate supposed good practice by showing a set of their own books. I did mark regularly and consistently and with the right colours, but it was never good enough. So I stopped using the colours as this was time consuming. Obviously the recent marking was not spotted because they are only looking for certain colours. The yellow box is an example of potentially lazy management (no specific offence to TTs yellow box). Use of colours is generally not for the kids – it is an easier way to monitor staff. Keep them busy, keep them tired, then they won’t have the energy to complain when they’re in capability. This is clearly a poor leadership issue manifest in your marking experience and probably deserves a separate blog. What does your marking look like when it gets the best results? I agree that book monitoring done badly is not useful. As any form of quality control, leaders need to consider a range of evidence. I think the one area of ‘student written response’ assessment that would be of value by SLT is a study of a sample of students’ work from across the range of their subjects. While it would be less than easy to compare what they were completing in maths with RE, I would be happy to have photocopied a page of their work from another subject area and shown to me to enquire ‘they’re writing at this standard and sophistication in English – how come I’m not seeing the same depth and clarity of thinking in their Geography work?’ I could then either flip out their 3 sided briliant essay from their ‘assessment folder’ that wasn’t asked for – or enquire of the student why they are turning out majestic writing in one subject, but not for me? (Which should also ask me to pose a few questions of myself.) Charting the steepness of the Alpine profile of response across subjects ‘could’ be a valid use of the procedure, if done in a constructive way. Who cares if students turn up as long as the work students produce is of a fantastic quality? Who cares if teachers don’t plan for the curriculum as long as the work students produce is of a fantastic quality? Who cares if teachers don’t pay attention to their students as long as the work students produce is of a fantastic quality? The answer to any of these questions (from a students’ performance-based perspective) would probably be ‘well, yes, quite’ because the phrasing entirely begs the question. When facing a new task students very rarely produce work of a fantastic quality because they need time for reflection, guidance and support, much of which comes in the form of written feedback. The real issue has got to be how to get students to produce work of a fantastic quality in the first place. How many things are done in schools for the same of compliance or simply because they’ve always been done? As you say, “The real issue has got to be how to get students to produce work of a fantastic quality in the first place.” Not, how to get teachers to follow a meaningless marking policy! if one set of books could deem me to be ’cause for concern’, could I show evidence of another set of books to demonstrate I am ‘gold star’. My year 10 produce inconsistent quality but my yr9 are fantastic. Is it the teacher who is a cause for concern or the individuals who fail to produce the quality expected? I work in an inner city school with difficult behaviour issues and high sen/pp/eal btw. I have been judged both ‘inconsistent’ and ‘outstanding’ this term. Perhaps the pupils are accountable? Inconsistent can also be caused by poor attendance and a whole host of other factors? Totally on the nail, David. In teaching I so often find myself muttering: Can’t you see the emperor has no clothes on! 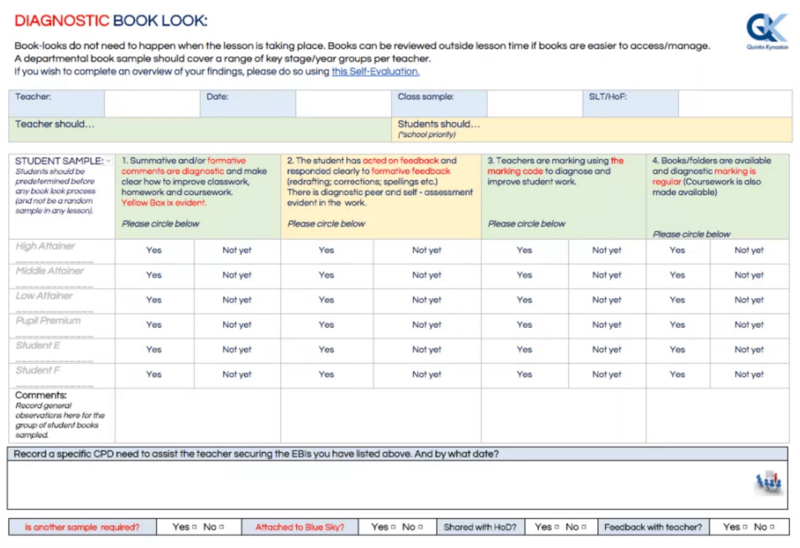 Book monitoring should have a specific and simple aim that is related to the students’ progress. For instance: are students able to transfer their literacy knowledge from one subject to another? If they aren’t, then what can we do about it in a constructive/fun etc way. There should be no blame or shame attached to it.